Captain George Harrison Oakes took Mary Jenness on her first voyage down to New York, and there loaded and sailed her to Livorno. He was proud of the new ship, the 505 ton, 132’ product of his father Joseph’s yard in Brewer. He hired Renault to paint her. Renault was a good choice for he would be appointed marine artist to the King of Italy. Captain Oakes is standing, telescope in hand on the main cabin house. A dinner is coming aft from the galley. Her mizzen flies her recognition signal, while the house flag of Oakes & Co. flies from the mainmast. Square sails on the foremast and fore-and aft sails on main and mizzen make her rig a barkentine. It meant a smaller crew and more efficient up wind sailing than larger full-rigged ships. Penobscot Marine Museum has the journal kept by thirteen year old Margaret Oakes who sailed with her father on the second voyage of the Mary Jenness in 1880. Read Margaret's journal in the Special Features section of this website; read her description of her stay in Marseilles in Stories of the Sea: Women's Roles. Captain G.H. Oakes is pictured on deck entering Leghorn (Livorno) Italy on November 29, 1876. 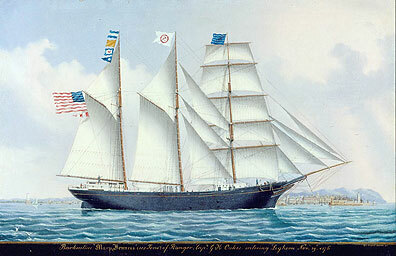 Oakes sailed the vessel until 1882.